"For his latest subversive intervention, the self-described "contemporary artist and pirate" Paolo Cirio wants to give you the offshore tax benefits enjoyed by major multi-national coporations. To that end he hacked the corporate registry website of the government of the Cayman Islands, a popular tax haven south of Cuba that ranks second only to Switzerland for being home to the world's secret and untaxed fortunes, stealing the identities of 200,000 companies registered there. Now he's selling off the identities for ¢99 apiece on Loophole4All.com so that small businesses and private citizens can enjoy the same tax breaks." "Just like any member of the public is able to do, the person who claims to have hacked our servers conducted a search for companies on the registry’s website,” Mr. Dixon said. “He then cut and pasted the names of these companies onto a template, in order to create bogus certificates. To the unsuspecting public, these fake certificates appear to be authentic." Mr. Dixon’s statements are false and he is scamming people. Mr. Dixon, his colleagues, and the Caymans government sell incorporation of fake shell companies, whose main purpose is to defraud the rest of world, causing onshore budget deficits and ever-growing impoverishment. Mr. Dixon’s work must be considered illegal, shameful, and "the biggest tax scam in the world,” as the U.S. President Barack Obama described Caymans activity in 2008. Mr. Dixon lies when he states that the information of companies registered in the Caymans is public. Simple access to the list of Caymans companies is granted only by request of a password, under legal disclaimers and with limited search functionality. Then, for no more detail than the names, the public must pay $35 for each additional entity, to reveal only a mailbox address and the date of incorporation. It would cost the public more than $7 million to get even a blurry picture of all the bogus companies falsely based in the Caymans islands. This “public” data is yet another fraud Mr. Dixon sells. The Caymanian Compass reports that there are only 92,000 companies registered in the Cayman Islands. However, the Loophole4all project discovered 215,880 companies. Many of them had suspicious notes attached to their names, showing how the Cayman Registry is nothing near an honest, public account, but has been corrupted by multinational firms and local lawyers. Liberating information means moving data from a locked platform and distributing it in a form that unveils and builds new knowledge. That is why here for the first time ever, you can download the entire list of Caymans companies: here. Loophole4all won't reveal the country that it will attack next. Before that, though, everyone is invited to shop on Loophole4All.com to crowd-fund the next attack by the pirates of the treasure islands in the dark international waters of legal loopholes. You can request to be removed from Loophole4All.com if you provide proof that you’re an honest and real local business. However, first you should ask for more transparency from the Caymans Registry (as someone of you already did) to be sure that no one else could hijack your business. As long as it's hard to verify your real information, it will be in danger. We cannot confirm that you can withdraw money at offshore bank branches using a certificate of incorporation as identification. However, it may work as valid documentation, since the owners of the companies are anonymous. A clarification for those who asked about the legality of the project: to steal the identity of a Caymans company is illegal only in the Cayman Islands, and Caymans court orders have very little credibility abroad. 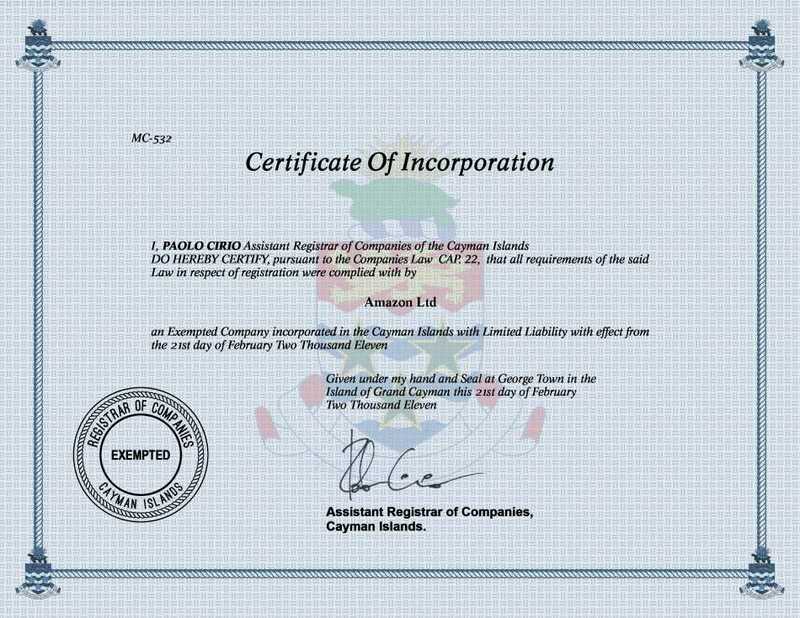 Avoiding taxes by registering a company in the Cayman Islands is legal everywhere. However, remember that hijacking offshore business is here mainly promoted as a form of protest and not to scam other people - that would invite the attention of the Interpol. Having a certificate and not using it is totally legal. As an alternative to hijacking a company, you can send your certificates by mail to your country’s Minister of Treasury as another form of political pressure. 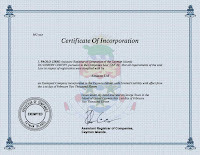 If you buy a hand-signed certificate or a mailbox, you will have the exclusive ownership of the company with a unique original printed certificate to collect. The other two basic purchase options are for unlimited copies. - Banning trade with corporations registered in a place without employees, manufacturing, or sales. - Banning the promotion and advertising of offshore instruments. Finally, with the following quotes, I'd like to dedicate this project to people who gave their life for what today I believe is the front in a war for possible social change through distributing the power of knowledge. "I want people to see the truth… regardless of who they are… because without information, you cannot make informed decisions as a public"
Bradley Manning, chat, 2010, unknown date and location. "Information is power. But like all power, there are those who want to keep it for themselves… We need to take information, wherever it is stored, make our copies and share them with the world." There have been some technical malfunctions in the first days of publication of Loopholes4All.com due to high traffic on cheap servers. If you have purchased a certificate, I would advice you to login to Loopholes4All.com with the email that you used for your order and re-download the high-resolution digital certificate. Also, the 200K low-res certificates have been reissued and moved to a data center in California.